The 32nd Inauguration Ceremony was successfully held on 29th March, 2016, at Rayson Huang Theatre, The University of Hong Kong. 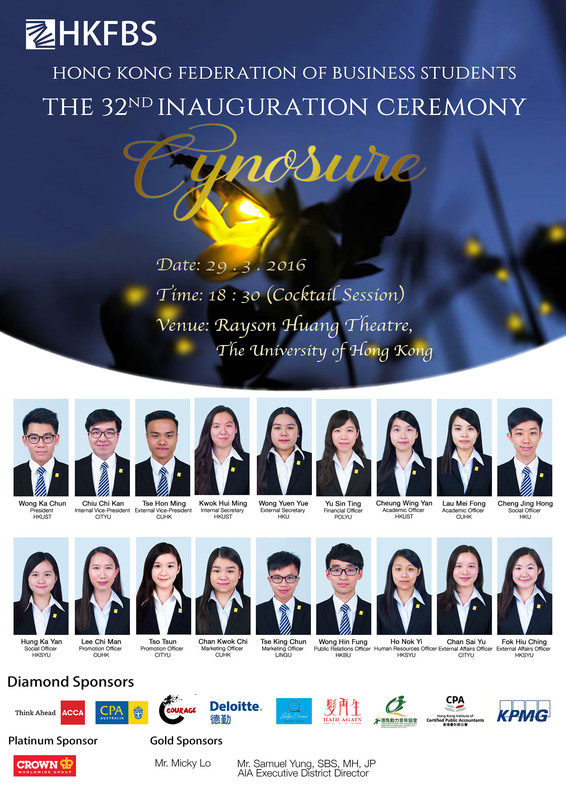 ‘Cynosure’ has been chosen as the theme for the Ceremony this year, signifying that Hong Kong Federation of Business Students will continue to take up the important role in the tertiary education sector as the centre of attention, bridging students from the 9 local universities in unison. We hereby thank all the guests that have attended the ceremony, which includes our Guest of Honour – Mr. Godfrey Leung King-kwok, JP; our Honourable Guest Speakers; as well as all Honourable Guests. We would also like to thank our Sponsors, past Executive Committee members, representatives from Member Societies and other business student societies that have given us immense support.